I recently purchased a Heavy Duty Compact Travel Umbrella from Crown Coast Umbrellas and got it just in time for some pretty rainy weather. To be honest, I thought I would be testing it in snowy conditions more than rainy, but we have had quite a bit of rain lately so it got a good test through the wind and the rain this past week or two. I was glad that I had it with me a few days ago when my car broke down and I was stranded along the roadside in the rain. With a flip of a button, the umbrella easily opened and was just as quick and easy to close when I returned to my car. It comes in your choice of colors, and I chose the blue one. If buying one for each family member, we could all have a different color to easily identify our own umbrella. 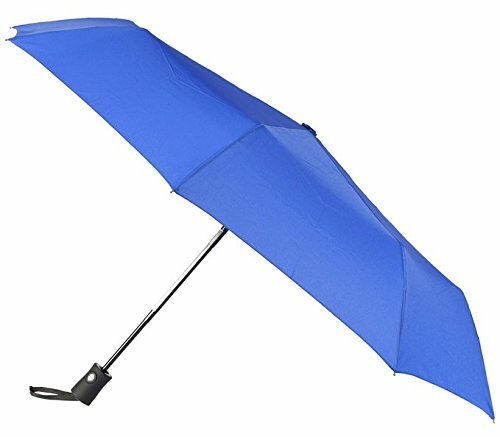 The umbrella is compact, so is easy to carry without taking up a lot of space. I can easily bring it along in my car or in my bag or a backpack. It is very sturdy, saying that it will hold up to 60 mph winds. I haven't tested this high of winds, but I do know that it was quite windy out the night I broke down, and this umbrella handled the winds nicely. Thinking back to the flimsy umbrellas I have purchased in the past, I wish I would have had umbrellas like this for my kids when they used to wait for the school bus in the rain. I can't tell you how many umbrellas were torn, bent, and mangled by high winds, and how many times one of the kids got soaked. This wouldn't have happened with an umbrella like this. I recommend this umbrella to anyone who needs a good, sturdy umbrella that is made to last. seems like every review for this thing is by someone who got it free. what gives? There are many companies who offer products free or at a reduced cost in exchange for an honest review. I didn't get this for free, but did get a discount, and even if I bought a dozen more I would still need to make the disclaimer according to FTC regulations because I got a discount on one of them. I don't know if any of the others got theirs for free or if they got a discount on their's. The companies do not ask for only positive reviews, only for honest ones. All opinions in my reviews are my own, and I would never allow a discount to sway my opinion.